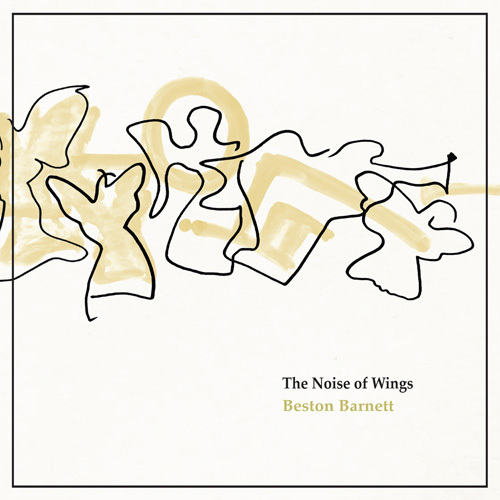 In The Noise of Wings, Beston Barnett performs a selection of hundred-year-old gospel standards, some hewing close to a traditional style while others explore African, Caribbean, or Latin-American interpretations. His notes from the album are below. Stories written two to three thousand years ago by religious groups whose central self-identifying experience was escape from slavery, those stories then translated into English under King James at a moment when the language was at its most inventive and vibrant, those words then transmogrified into moans, shouts, and hollers by another people just themselves freed and struggling in the aftermath of slavery: traditional African-American gospel is some of the heaviest songwriting out there. The subject matter is death: death as revelator of mysteries, as re-uniter of families and communities, as final comfort against earthly sorrows. It’s a sentiment that can be balm or joyful railing or bittersweet delusion, but these songs surely carry a universal power for believers and non-believers alike. I grew up a sort of cultural half-Jew in Nashville, atheist as I could be, and still am. But I also grew up with gospel music, and loved it, and hear it still as the most lucid dream of home. I connected with it directly – bypass the brain and straight to the heart – but as I became a musician, I of course pieced its technical elements together: simple chords and basic melody, rhythm of layered syncopations, endless vocal possibilities for texture and pathos. I learned to play music from the Congo, South Africa, Brazil, Cuba, and everywhere I went within the towering architecture of the Great Tree of the African Musical Diaspora, I felt resonances of home. In this collection of old gospel songs, I invent nothing. Some tracks I hew close to traditional; others, it’s as if I’d cobbled together a long vine-y bridge between two disparate branches of the Great Tree. But every folkloric zigzag I took seems like it was latent, as the forest is latent in the seed. The Congo, South Africa, Brazil, Cuba were there already. Haunting. To anyone wanting to hear the original sources that inspired this album, I recommend as a starting place: Josh White, Reverend Gary Davis, the Georgia Sea Island Singers, the Golden Gate Quartet, Reverend Cleophus Robinson. When I listen to gospel music, it’s mostly the primitive Baptist music of Southern Appalachia, or a good Jubilee Quartet like the Golden Gate, or the Heavenly Gospel Singers or maybe a more modern ‘50s-ish group like the Swan Silvertones or Dixie Hummingbirds. Maybe I’ll listen to a fine bluegrass or old timey gospel number by the Blue Sky Boys or Bill Monroe. I almost never listen to modern gospel songs, and I don’t believe Beston Barnett has much either. In his latest CD, The Noise of Wings, I hear a lot of old time sounds here. Some have been taken and played in a style that heretofore hasn’t been done before like a knock out West Indian version of “Angel Band” and another of “Just a Closer Walk with Thee” and an almost bluesy version of “Rock My Soul in the Bosom of Abraham.” Some are more or less presented in a traditional manner like “Moses Moses,” which sounds like an old Georgia Sea Island presentation, or an African piece “Nkosi Sikelel’ iAfrika” or right out of a Golden Gate Quartet 78 “Swing Down Sweet Chariot” and one of those more modern churchy groups gives out “Old Ship of Zion.” Little highlights of jazz, various kinds of Latin and African rhythms plus some very tasteful resonator guitar licks top off the score. Where it’s needed you might hear the clarinet of Matt Gill, or the drum kit of Matt Taylor, or the cornet of Bruce Vermazen, or even some harmonica, whistling, and triangle by Jeffrey Joe Morin, Pete Miesner, and Chad Farran; and the bongos of Aaron Irwin, but only where it adds something to the performance. I hear so many presentations where friends are added to the mix, only I think because they are friends, and they only add to a mix that doesn’t sound anything like the performer intended, but you can’t refuse that “hey, can I be on your CD and my feelings will be hurt if I’m not” vibe. That isn’t the case here. In most every case the backup is just what is needed to make the performance what it was intended to be. The is a fine recording, the music is tight and well put together and should please those who are gospel fans or not. Categories: album, The Noise of Wings (2011) | Permalink.